Craps is an exciting dice game many of you will recognise from the famous casinos and movies. 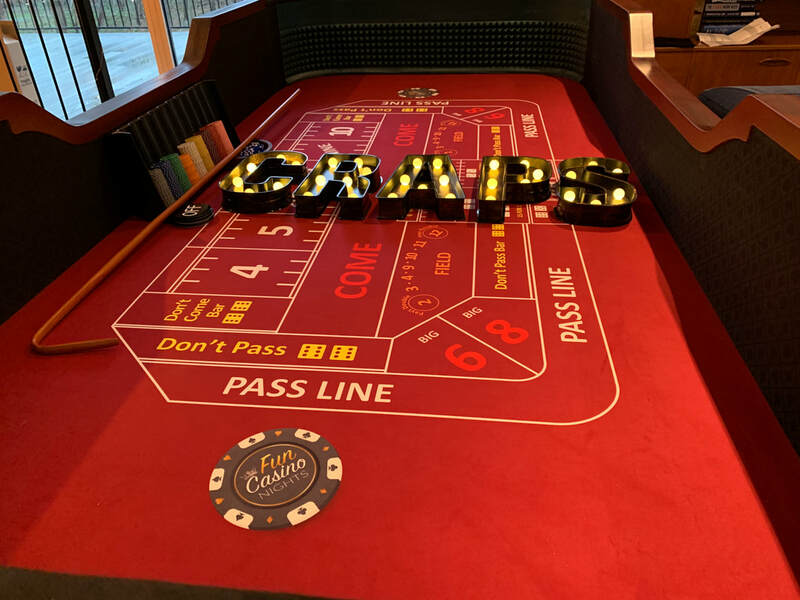 Often a centrepiece to many casino events, Craps will have your guests gathering round our tables to bet on the outcome of dice! 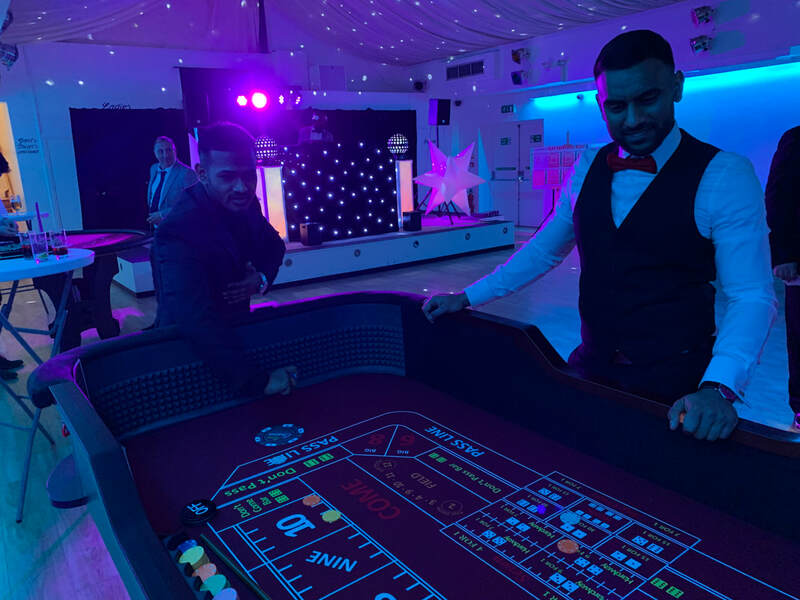 Even if your guests have never played Craps before, our friendly croupiers will help them to get going in just minutes. Will you throw your lucky number? Craps is a game like no other - the players bet on the outcome of thrown dice and a wide variety of options. The game will start with the button (see picture) showing its "Off" side-up. This indicates to players that the only bets that can be made are in the "Pass Line" and "Don't Pass Bar" - once the bets have been made one player is selected by the croupier to be this round's dice shooter. ​The shooter will be handed five dice and any two will be chosen to throw and hit the end cushion of the table. The numbers that the dice rest on will decide which bets are won, lost and can be played next! Casino Craps (or Bank Craps), a dice game, is one of the most exciting casino games. It is common to hear yelling and shouting at a craps table. It is played on a purpose-built table and two dice are used. The dice are made after very strict standards and are routinely inspected for any damage. To begin, the Shooter (one of the players) must bet at least the table minimum on either the Pass Line or the Don't Pass Line (sometimes called 'win' or 'right' bets and 'don’t win' or 'wrong' bets). The shooter is presented with multiple dice (normally five) by the Stickman, and must choose two to roll with. The remaining dice are returned to the Stickman's Bowl and are not used. The shooter must handle the dice with one hand only when throwing and the dice must hit the walls on the opposite end of the table. In the event that one or both dice are thrown off the table, they must be inspected (usually by the stickman) before putting them back into play. The craps table can accommodate up to about 20 players, who each get a round of throws or at 'shooting' the dice. If you don't want to throw the dice, you can bet on the thrower. Several types of bets can be made on the table action. Each round has two phases: Come Out and Point. To start a round, the shooter makes one or more Come Out rolls. A Come Out roll of 2, 3 or 12 (called Craps, the shooter is said to 'crap out') ends the round with players losing their Pass Line bets. A Come Out roll of 7 or 11 (a Natural) results in a win for Pass Line bets. The shooter continues to make Come Out rolls until he rolls 4, 5, 6, 8, 9, or 10, which number becomes the Point. The dealer then moves an On button to the point number signifying the second phase of the round. If the shooter rolls the point number, the result is a win for bets on the Pass Line. If the shooter rolls a seven (a Seven-out), the pass line loses and the round ends. The first roll of the dice in a betting round is the Come Out roll - a new game in Craps begins with the Come Out roll. A Come Out roll can be made only when the previous shooter fails to make a winning roll, that is, fails to make the Point or makes a Seven-out (rolls a seven). A new game then begins with a new shooter. If the current shooter does make his Point, the dice are returned to him and he then begins the new Come Out roll. This is a continuation of that shooter's roll, although technically, the Come Out roll identifies a new game about to begin. When the shooter fails to make his or her Point, the dice are then offered to the next player for a new Come Out roll and the game continues in the same manner. The new shooter will be the person directly next to the left of the previous shooter - so the game moves in a clockwise fashion around the craps table. Pass bets win when the come out roll is 7 or 11, while pass bets lose when the come out roll is 2, 3, or 12. Don't bets lose when the come out roll is 7 or 11, and don't bets win when the come out roll is 2 or 3. Don't bets tie when the come out roll is 12 (the 'Bar' roll on the layout indicates which roll is treated as a tie). A player joining a game and wishing to play craps without being the shooter should approach the craps table and first check to see if the dealer's 'On' button is on any of the point numbers. If the point number is Off then the table is in the Come Out round. 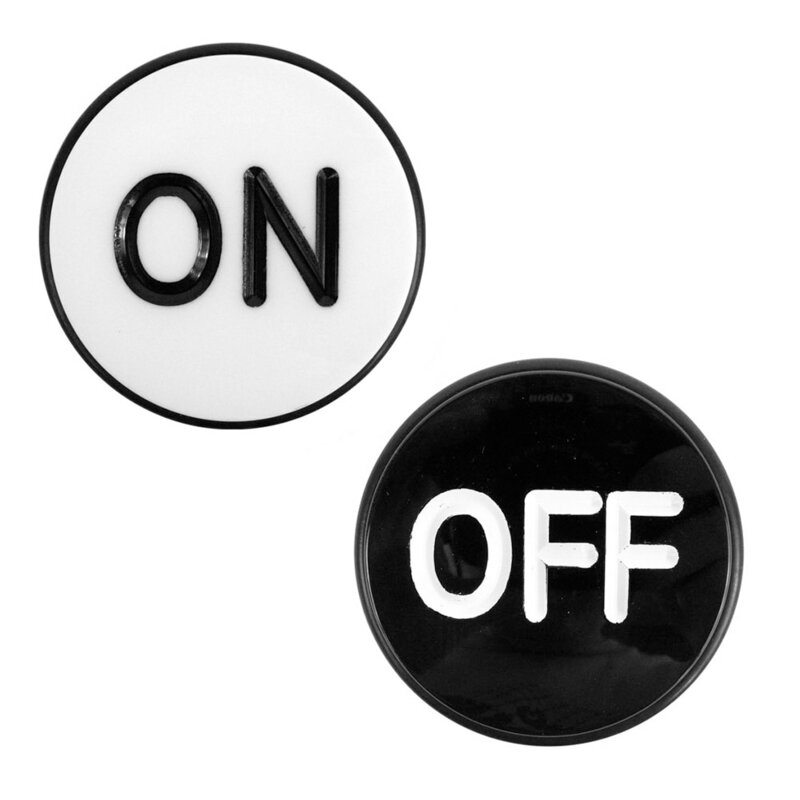 If the dealer's button is 'On', the table is in the Point round where most casinos will allow a Pass Line bet to be placed. All single or multi roll 'Proposition bets' may be placed in either of the two rounds. 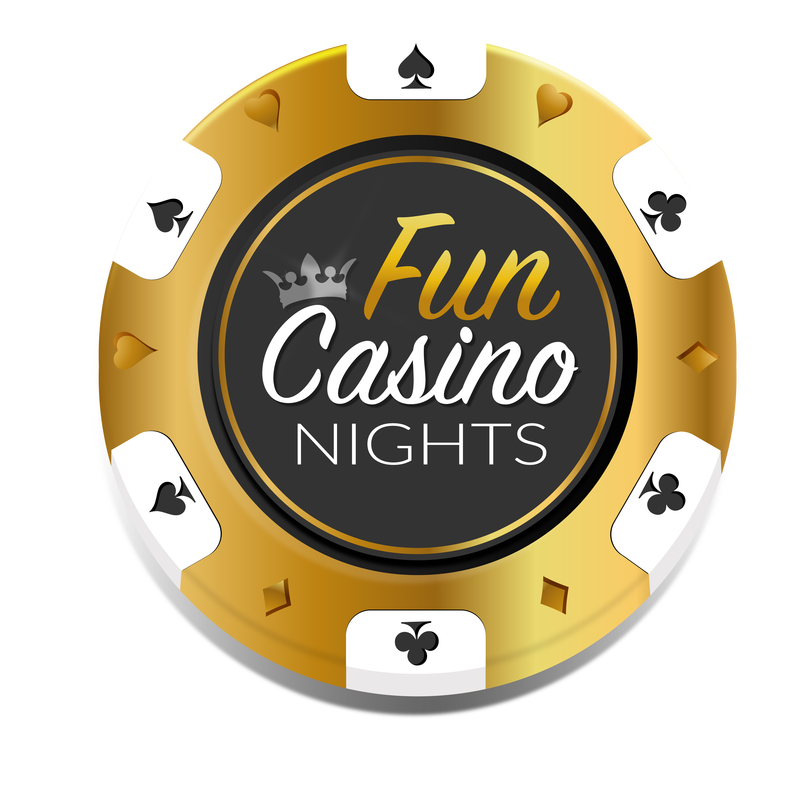 Between dice rolls there is a period for the dealers to make payouts and collect the losing bets, after which players can place new bets. The stickman monitors the action at the table and decides when to give the shooter the dice, after which no more betting is allowed. Pass Line Bet - You win if the first roll is a natural (7, 11) and lose if it is craps (2, 3, 12). If a point is rolled (4, 5, 6, 8, 9, 10) it must be repeated before a 7 is thrown in order to win. If 7 is rolled before the point you lose. The fundamental bet in craps is the Pass Line Bet, which is a bet for the shooter to win their point number. A Pass Line Bet is won immediately if the Come Out roll is a 7 or 11. If the Come Out roll is 2, 3 or 12, the bet loses (known as 'crapping out'). If the roll is any other value, it establishes a Point; if that point is rolled again before a seven, the bet wins. If, with a point established, a seven is rolled before the point is re-rolled, the bet loses ('seven out'). A Pass Line win pays even money. Odds on Pass Line Bet - After a point is rolled you can make this additional bet by taking odds. There are different payoffs for each point. A point of 4 or 10 will pay you 2:1; 5 or 9 pays 3:2; 6 or 8 pays 6:5. You only win if the point is rolled again before a 7. Come Bet - It has the same rules as the Pass Line Bet. The difference consists in the fact you can make this bet only after the point on the pass line has been determined. On a Come Out roll the Come Bet is placed on the pass line as they are an identical bet. After you place your bet the first dice roll will set the come point. You win if it is a natural (7, 11) and lose if it is craps (2, 3, 12). Other rolls will make you a winner if the come point is repeated before a 7 is rolled. If a 7 is rolled first you lose. A Come Bet is played in two rounds and is played similar to a Pass Line Bet. The main difference is that a player making a Come Bet will bet on the first point number that 'comes' from the shooter's next roll, regardless of the table's round. If a 7 or 11 is rolled on the first round, it wins. If a 2, 3 or 12 is rolled, it loses. If instead the roll is 4, 5, 6, 8, 9, 10 then the Come Bet will be moved by the base dealer onto a Box representing the number the shooter threw. This number becomes the Come Bet point and the player is allowed to add odds to the bet. The dealer will place the odds on top of the Come Bet, but slightly off center in order to differentiate between the original bet and the odds. The second round wins if the shooter rolls the Come Bet before a seven. If the seven comes before the number (the Come Bet), the bet loses. On a Come Out roll for the pass line the Come Bet is in play, but traditionally the odds are not working unless the player indicates otherwise to the dealer. Because of the Come Bet, if the shooter makes their point, a player can find themselves in the situation where they have a Come Bet (possibly with odds on it) and the next roll is a Come Out roll. In this situation odds bets on the come wagers are presumed to be not working for the Come Out roll. That means that if the shooter rolls a 7 on the Come Out roll, any players with active Come Bets waiting for a 'come point' lose their initial wager but will have their odds money returned to them. If the 'come point' is rolled the odds do not win but the Come Bet does and the odds are returned. The player can tell the dealer that they want their odds working, such that if the shooter rolls a number that matches the 'come point', the odds bet will win along with the Come Bet, and if a seven is rolled both lose. Odds on Come Bet - Exactly the same thing as the Odds on Pass Line Bet except you take odds on the Come Bet not the Pass Line Bet. Don't Pass Line Bet - This is the reversed Pass Line bet. If the first roll of a dice is a natural (7, 11) you lose and if it is a 2 or a 3 you win. A dice roll of 12 means you have a tie or push with the casino. If the roll is a point (4, 5, 6, 8, 9, 10) a 7 must come out before that point is repeated to make you a winner. If the point is rolled again before the 7 you lose. Don't Come Bet - The reversed Come Bet. After the come point has been established you win if it is a 2 or 3 and lose for 7 or 11. 12 is a tie and other dice rolls will make you win only if a 7 appears before them on the following throws. Place Bets - This bet works only after the point has been determined. You can bet on a dice roll of 4, 5, 6, 8, 9 and 10. You win if the number you placed your bet on is rolled before a 7. Otherwise you lose. The Place Bets payoffs are different depending on the number you bet on. 4 or 10 will pay 9:5; 5 or 9 pays 7:5, and 6 or 8 pays 7:6. You can cancel this bet anytime you want to. Field Bets - These bets are for one dice roll only. If a 2, 3, 4, 9, 10, 11, 12 is rolled you win. A 5, 6, 7 and 8 make you lose. Field Bets have the following different payoffs: totals of 2 and 12 pay double (2:1). Other winning dice rolls pays even (1:1). Big Six, Big Eight Bets - Placed at any roll of dice these bets win if a 6 or 8 comes out before a 7 is rolled. Big Six and Big Eight are even bets and are paid at 1:1.